For those who do not know me well, allow me to start with this: I have a list. This list is full of all the goals, large and small, that I want to achieve. Some are things like learning martial arts, or playing blues harp, or riding my motorcycle on a long road trip. Some are things like raise chickens, live off my own garden and make the world a better place – you just never know what’s going to be on the list. The idea is this: when something gets to the top of the list, you do it (or you put significant effort into figuring it out). Today we can mark “raise chickens” off the list. Last month, on July 4th, we brought home our four little ladies (ages 10-16 weeks). Their names (from left to right): Cluck Norris (a cinnamon queen), Chicken Tetrazzini (a Salmon Faverolle), Nugget (a Welsummer) and Hen-rietta (an Americauna). Having had them a month, I can officially say they are growing to be a big part of our family. They are very low maintenance and will start producing eggs in about 8 weeks. Above: Our chicken coop at about 90% complete. 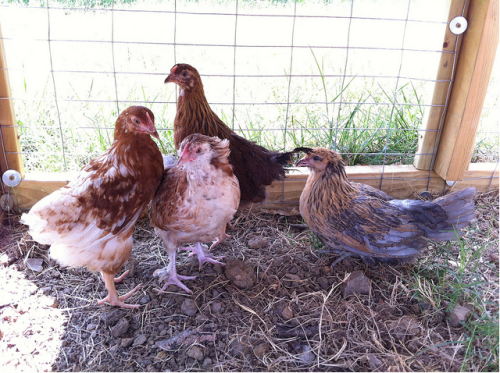 Amy and I are proud to be among the few city dwellers in Nashville to have our permit and be raising chickens near downtown. Soon we will be getting upwards of 4 eggs per day to go along with the fresh veggies from the garden. It’s been fun to have friends and family over to teach them about our chickens, and raising chickens in general. Im sure this is just the first part of our chicken story, but… another list item, completed!